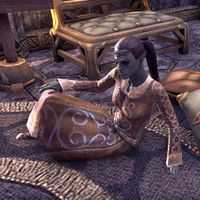 Adansa Vadryon is a Dunmer drunkard who can be encountered on the upper floor of the Hissing Guar in Kragenmoor in the company of Nendryl Vadryon and Vurdras Thervayn. They sit on the floor around a hookah, appearing to be very relaxed, and thus won't talk to you. This page was last modified on 12 October 2017, at 12:29.